A couple of years ago, as part of Disney California Adventure's park-wide upgrades, the wild mouse roller coaster at Paradise Pier was given a face lift to a new theme. Gone was the cartoon-y zaniness of Mulholland Madness, and in was... the cartoon-y zaniness of Goofy's Sky School. Themed after a flight instruction class led by everyone's favorite bird-brained... um, whatever Goofy is, Goofy's Sky School slapped on a fresh coat of paint, new sets, and new graphics, creating a cute overlay for the fun little ride. And though it's a same ride, something about having Goofy heading up the effort just makes it a little more lovable! 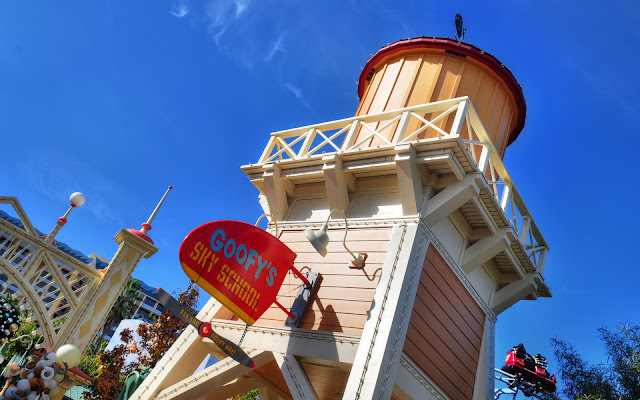 The water tower marks the entrance to the line for Goofy's Sky School.